Workplace Wise - BrownWinick Employment Law Blog: Have 100 or More Employees? You Need a Pay-Equity Audit STAT! Have 100 or More Employees? You Need a Pay-Equity Audit STAT! The EEOC announced today its plan to revise the EEO-1 report to collect data on pay ranges and hours worked, in order “to assess complaints of discrimination, focus agency investigations, and identify existing pay disparities that may warrant further examination.” If the Office of Management and Budget approves the new EEO-1, employers will have to start providing the pay/hours data in the 2017 EEO-1 collection cycle. You can review the proposed form, as well as a Questions and Answers document and a Fact Sheet on the EEOC’s website. In the meantime, employers would be wise to get ahead of the game and start conducting a pay-equity self-audit. (Better to have the house in order before the EEOC comes knocking!) 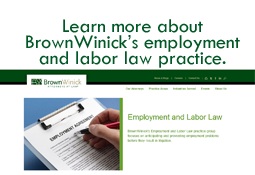 Contact a member of BrownWinick’s Employment Practice Group for assistance.